Have you ever wished you could have a rock and roll redo? You know that show you missed or if you would have arrived to the show a little early to see that opening band because they went on to become MEGA-stars? This weekend will afford some here in New Orleans that EXTREMELY rare chance with Guns N' Roses and The Cult at the Mercedes-Benz Superdome Sunday night. 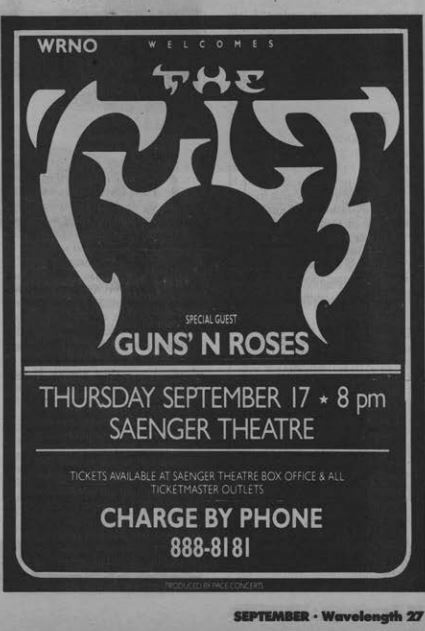 Almost 29 years ago The Cult played the Saenger Theater and at the time an unknown band out of L.A. named Guns N' Roses opened the show. The Cult were riding high off of their third album "Electric" with hits like "Love Removal Machine", "Wildflower" and "Lil Devil." With a name like Guns N' Roses in the late 80's, they sounded as if they could be any hard rocking hair band you might want to skip coming out of L.A. at the time. We hadn't heard of them or any of their music so it was hard to judge their value as an opening act. A bunch of us Cult fans couldn't wait to see them live and rolled downtown to the Saenger early enough to catch the opening act if we wanted to. Now nearly 30 years have passed and while my recall fades with each passing day I do remember hanging out in the lobby as the opening act began. I walked over to the huge door leading into the theater, opened it up, heard a slab of noise from the band playing on stage and basically shut the door, thinking "ah, whatever." I never walked inside to see Guns N' Roses, missed it, all of it, not a second thought because that night It was all about The Cult. Specifics of The Cult's performance escape me but they rocked and if my memory serves me, the band said it was the last night of their U.S. tour. What I also think I remember is some members of Guns N' Roses walked out on the stage toward the end of the show with just towels on and Ian Astbury tackled one of them trying to rip off his towel. If that never happened, I promise I've believed that since 1987 so please forgive me! Some months after the show I saw a video on MTV and I thought who in the heck is this? (I didn't say heck) It was "Welcome to the Jungle" by of course, Guns N' Roses. I said to myself, "Wait, is that the band that opened up for The Cult?" That's right, I pretty much ignored one of the biggest debuts in the history of rock and roll right there in downtown New Orleans. How cool would it have been to say 'I saw Guns N' Roses open for The Cult' before most of the world had a clue? But I couldn't. I vowed never to miss another opening act and for the most part I've stuck to it and thankfully so because I've seen some great openers that have gone on to great success.